Looking for a close by educational trip for your classroom or camp? Consider bringing them to the Shore Line Trolley Museum. We are located in East Haven, a mile and a half from I-95. We are a 501(c)3 educational facility. Not only will children get a re-live a time period considered to be the golden age of transportation, they will get an education about how trolley cars were in almost every town in Connecticut and the impact they had in making Connecticut grow from late 1800’s through the end of World War II. 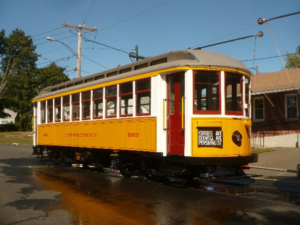 The educational program will include: a brief history of the trolley car, how it works, and how the electric railway system was (and continues to) hold the smallest carbon footprint in the transportation industry. The students will get a 3 mile round trip trolley ride along some of the most pristine salt marshes in Connecticut, seeing many birds and marine life along the way. They will also learn about our historic trolley line which opened in 1900 connecting the city of New Haven with the growing shore line community. We can cater your visit to the needs of your children, age, interest or other special requirements. School charter tours typically lasts about an hour. Trolleys can hold up to 45 individuals. The best part of the tour is our special school rate and all teachers/advisors are free! We also have free parking for buses and parents. To request a school visit, please fill out our form here. For more information, contact us at reservations@shorelinetrolley.org or (203) 467-6927.